The Optiledge pallet handling alternative, supplied exclusively by Australian Warehouse Solutions, was originally designed by IKEA, offering an effective and economical solution for transporting goods. 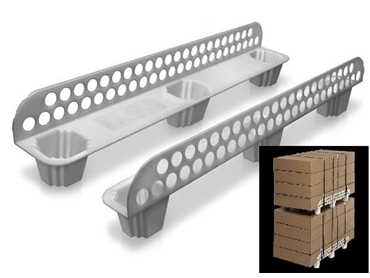 The new design conforms to the size and shape of the product being transported, not the other way around, allowing for flexibility and refined pallet stacking. Capable of supporting a load up to 2 tons, each pallet handling unit weighs only one kilogram, reducing the weight of a typical truckload by over one ton and reducing fuel and transportation costs. Unlike wooden pallets, the Optiledge pallet handling alternative does not require fumigation or inspection, and can be used with traditional pallet jacks, forklift trucks and motorised pallet trucks.